We decided to reserve this space to show you something interesting seen in our tours. The only condition is the photo should be taken during the course of any of our tours. Normally will be photos digiscoped, because that was the way our clients saw it. Some occasions will be a photograph taken in the traditional way. Hope you enjoy it. 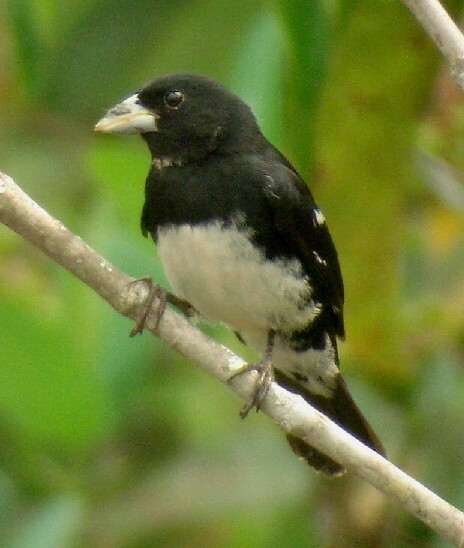 The Cone-billed Tanager was rediscover in our tour to Emas NP in August 25, 2003, when a male adult was seen by our guide Braulio A. Carlos who immediately point out that bird to be this species. Quiet a long distance from the doubtful type locality, wrong habitat and also a striking bluish-grey bill. Few illustrations available showed that species with black bill. For several years we looked for this species in all types of dry habitats, Braulio even went to Ecuador to see the Black-and-White Tanager (Conothraupis speculigera)), did a recording and looked for it with that tape, we expected the voice should be something similar (Vide Austral Rail, Kaempfer's Woodpecker to mention a few). Exactly 65 years before, in August 25, 1938 Dr. A. Vellard collected this species in the Mato Grosso region. The type and unique specimen (in the Paris Museum) was all known about this bird. No description of the female and (now we know) even the habitat proved to be wrong. It was only in 2004, when our friend Dante Buzetti, working with White-winged Nightjar ecology in Emas NP at that time, followed Braulio's instructions in where to go and look for this mythical bird, obtaining the first recordings of the species. A week later, Braulio and some clients join him to take more pictures, do a short film (now you can watch it below) and take notes on behavior and ecology. Since our rediscovery, we manage to find the right habitat, female plumage, vocalizations (song and calls), territories and ecology. As far as now, we are the only bird tour operator who are able to show this bird to clients, you can see this bird in our CERRADO SPECIALTIES birding tour. This is the very first video ever made of Cone-billed Tanager, and is still the only one showing both male and female sitting together. It was very exciting when we were there and hopefully you enjoy it.